Pinterest is undoubtedly my favourite "social media". I use Pinterest as a tool for inspiration, getting ideas for personal, editorial photo shoot. When working with clients, helping them with their images creative direction, curating the right images for their branding to create brand consistency. I use the Pinterest board not only for their photoshoot, also for the creative direction, including brand colours, mood and feel they want to translate in their images, the props that will be part of the photo shoot with the idea to narrow it down to a clear visual strategy and set a plan to create and / or curate the images that will work with their brand. How can you develop a creative direction for your brand? Start by creating secret board on Pinterest, it's up to you if you want to keep it secret. What to pin on your board? Start with your brand style, choose the elements that stand out in your brand story. What keywords are standing out in your story? i.e bold, elegant, joyful? Choose images relevant to these keywords and start adding them to your Pinterest board. Do the same for your brand colours, choose colour inspiration with images that match the colour tones in your branding and want in your visual content. You don't have to limit yourself to the type of content you're looking for, i.e when you look for the colour orange colour don't just select a colour backdrop, choose an orange umbrella, oranges rocks, a dress, a sunset, this might not make sense at all but keep pinning without censoring yourself. The idea is to be inspired and grab ideas that make you think outside the box. Don't forget to add typography and graphics that match your branding. Once you have a board with 30-40 images, narrow down your selection, look for harmony and consistency with images that work together, delete the ones that stand as the odd one out. With the ones you've kept, write down why you've selected this specific image, what made you choose this one? What do you like about it? How does it make you feel? 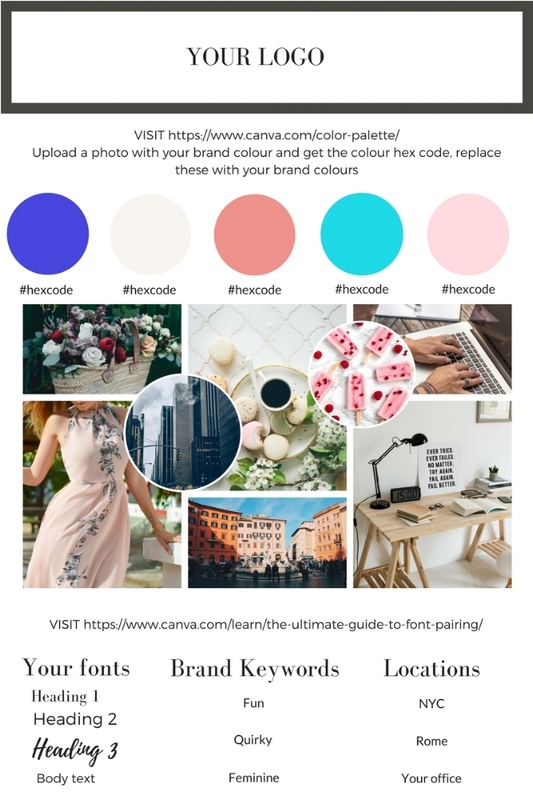 Add the images you choose for your brand colour in canva colour palette generator , to get your colour codes. Add all you other images on a board created in Canva and add the colour hex code generated by Canva colour palette on your board. You should now have a vision board with 4-5 brand colour patches and about 10 images. Ad your brand keywords, font type to the board to create a cohesive vision for your brand. What theme can you see emerging? Write it down, i.e wild, luxury, joyful, elegant. Like standing in a museum in front of a painting, display your board on a computer screen and step back, what jumps to minds, let yourself permeate with the mood, colour tones, the images. Go back to your Pinterest board, delete all the images that do not match these emerging themes, colours and fonts you've selected. Now that you have a defined brand theme for your visual branding strategy it's time to add props that you would like to features in your visual content, images, and to use for a photoshoot or in curated images. Now that you have a very clear idea of how your images will feel and look like it's time to plan to create / curate your visual content. Plan for your static visual content. i.e. images that won't change too often, for your website, about pages. Plan for your variable visual content. i.e images for your social media, images size, orientation, colour palette. How can you introduce the emerging themes in your image, what type of details do you want in your images? Who will be in the images, where will you photograph them, doing what? Write down a plan and scenario for your shot from this mood board. Create a detailed shot list with your vision board and final Pinterest board in mind. The most important have fun! This process will help you create and / or curate images with a strategic vision in mind for your brand, it will not only help you with brand consistency but help to stand out and tell your unique story to get more engagement!